Upon the ratification of the Charter of the United Nations in October 1945, the United Nations was officially established. The United Nations Conference on International Organizations, held in San Francisco in April 1945, brought together representatives of the Allied countries to discuss opportunities for international collaboration. The UN was designed to replace the League of Nations, since the League failed to prevent the outbreak of World War II. The U.S. led the way in the creation of the UN. The first concrete plan for the UN began in the State Department, and FDR coined the term “United Nations.” The U.S. also hosts the UN world headquarters in New York City. The UN’s ability to procure peace was limited by superpower rivalry during the Cold War. After the Cold War, the UN saw a radical expansion in its peacekeeping duties, taking on more missions in ten years than in the previous four decades. perestroika: A political movement for reformation within the Communist Party of the Soviet Union during the 1980s, widely associated with Soviet leader Mikhail Gorbachev and his glasnost (meaning “openness”) policy reform. League of Nations: An international organization founded as a result of the Treaty of Versailles, which ended the first World War. Proposed by Woodrow Wilson, its goals included disarmament, preventing war through collective security, settling disputes between countries through negotiation, diplomacy, and improving global quality of life. United Nations: An intergovernmental organization to promote international cooperation founded in 1945. The United Nations (UN) is an international organization whose stated aims are facilitating cooperation in international law, international security, economic development, social progress, human rights, and achievement of world peace. The UN was founded in 1945 after World War II to replace the League of Nations, stop wars between countries, and provide a platform for dialogue. It contains multiple subsidiary organizations to carry out its missions. The League of Nations failed to prevent World War II (1939–1945). Because of the widespread recognition that humankind could not afford a third world war, the United Nations was established to replace the flawed League of Nations in 1945. The League of Nations formally dissolved itself on April 18, 1946, and transferred its mission to the United Nations: to maintain international peace and promote cooperation in solving international economic, social, and humanitarian problems. In December 1945, the U.S. Congress requested that the UN make its headquarters in the United States. The UN accepted this suggestion and after considering different sites, constructed the United Nations headquarters building in New York City in 1949-1950. The UN headquarters officially opened on January 9, 1951, although construction was not formally completed until October 9, 1952. While the principal headquarters of the UN remain in New York City, major agencies base themselves in Geneva, The Hague, Vienna, Nairobi, and elsewhere. The earliest concrete plan for a new world organization was begun under the U.S. State Department in 1939. Franklin D. Roosevelt first coined the term “United Nations” as a term to describe the Allied countries. The term was first officially used on January 1, 1942, when 26 governments signed the Atlantic Charter, pledging to continue the war effort. On April 25, 1945, the UN Conference on International Organization began in San Francisco, attended by 50 governments and a number of non-governmental organizations involved in drafting the United Nations Charter. The UN officially came into existence on October 24, 1945, upon ratification of the Charter by the five then-permanent members of the Security Council—France, the Republic of China, the Soviet Union, the United Kingdom, and the United States—and by a majority of the other 46 signatories. The first meetings of the General Assembly, with 51 nations represented, and the Security Council took place in London in January 1946. Since then, the UN’s aims and activities have expanded to make it the archetypal international body in the early 21st century. United Nations Peacekeeping began in 1948. Its first mission was to observe and maintain the ceasefire in the Middle Easte during the 1948 Arab-Israeli War. Since then, UN peacekeepers have taken part in 63 missions around the globe, 17 of which continue today. The peacekeeping force as a whole received the Nobel Peace Prize in 1988. Though the term “peacekeeping” is not found in the United Nations Charter, the authorization for these activities is generally considered to lie in Chapters 6 and 7. Chapter 6 describes the Security Council’s power to investigate and mediate disputes, while Chapter 7 discusses the power to authorize economic, diplomatic, and military sanctions, as well as the use of military force, to resolve disputes. The founders of the UN envisioned that the organization would act to prevent conflicts between nations and make future wars impossible; however, the outbreak of the Cold War made peacekeeping agreements extremely difficult due to the division of the world into hostile camps. Following the end of the Cold War, there were renewed calls for the UN to become the agency for achieving world peace, and the agency’s peacekeeping dramatically increased, authorizing more missions between 1991 and 1994 than in the previous 45 years combined. Throughout the Cold War, tensions on the UN Security Council made it difficult to implement peacekeeping measures in countries and regions associated with the spread or containment of leftist and revolutionary movements. While some conflicts were separate enough from the Cold War to achieve consensus support for peacekeeping missions, most were too deeply enmeshed in the global struggle. Though the UN’s primary mandate was peacekeeping, the division between the U.S. and USSR often paralyzed the organization. In 1956, the first UN peacekeeping force was established to end the Suez Crisis; however, the UN was unable to intervene against the USSR’s simultaneous invasion of Hungary following that country’s revolution. In 1960, the UN deployed United Nations Operation in the Congo (UNOC), the largest military force of its early decades, to bring order to the breakaway State of Katanga, restoring it to the control of the Democratic Republic of the Congo by 1964. The UN Peacekeeping Force in Cyprus (UNFICYP) began in 1964 to end the conflict between the ethnic Greeks and Turks on the island and prevent wider conflict between NATO members Turkey and Greece. A second observer force, UNIPOM, was dispatched in 1965 to the areas of the India-Pakistan border that were not being monitored by the earlier mission, UNMOGIP, after a ceasefire in the Indo-Pakistani War of 1965. Neither of these disputes had Cold War or ideological implications. There was one exception to this rule. In the Mission of the Representative of the Secretary-General in the Dominican Republic (DOMREP), 1965–1966, the UN authorized an observer mission in a country where ideological factions were facing off. However, the mission was only initiated after the U.S. intervened unilaterally in a civil war between leftist and conservative factions. The U.S. consolidated its hold and invited a force of the Organization of American States (dominated by U.S. troops) to keep the peace. The mission was approved mainly because the Americans presented it as fait accompli and because it was not a full peacekeeping force, including only two observers at any given time and leaving the peacekeeping to another international organization. It was the first time the UN operated in this manner with a regional bloc. The UN also assisted with two decolonization programs during the Cold War. In 1960, the UN sent ONUC to help facilitate the decolonization of the Congo from Belgian control. It stayed on until 1964 to help maintain stability and prevent the breakup of the country during the Congo Crisis. In West New Guinea from 1962 to 1963, UNSF maintained law and order while the territory was transferred from Dutch colonial control to Indonesia. With the decline of the Soviet Union and the advent of perestroika, the Soviet Union drastically decreased its military and economic support for a number of “proxy” civil wars around the globe. It also withdrew its support from satellite states. One UN peacekeeping mission, UNGOMAP, was designed to oversee the Pakistan-Afghanistan border and the withdrawal of Soviet troops from Afghanistan as the USSR began to refocus domestically. In 1991, the USSR dissolved into 15 independent states. Conflicts broke out in two former Soviet Republics, the Georgian-Abkhazian conflict in Georgia and a civil war in Tajikistan, eventually policed by UNOMIG and UNMOT respectively. With the end of the Cold War, a number of nations called for the UN to become an organization of world peace and encourage the end to conflicts around the globe. The end of political gridlock in the Security Council substantially increased the number of peacekeeping missions. In a new spirit of cooperation, the Security Council established larger and more complex UN peacekeeping missions with more non-military elements to ensure the proper operation of civic functions such as elections. The UN Department of Peacekeeping Operations was created in 1992 to support the increased demand for such missions. A number of missions were designed to end civil wars in which competing sides were sponsored by Cold War players. UN Headquarters: The US took the lead in establishing the UN. The UN world headquarters are located in New York City. The Nuremberg Trials were military tribunals that tried Nazi political and military leadership for alleged crimes committed during the war. The Nuremberg Trials were a series of military tribunals held by the Allied forces of World War II, most notable for the prosecution of prominent members of the political, military, and economic leadership of Nazi Germany. The trials were held in the city of Nuremberg, Bavaria, Germany, in 1945 and 1946 at the Palace of Justice. Held between November 20, 1945, and October 1, 1946, the tribunal was given the task of trying 23 of the most important political and military leaders of the Third Reich. Adolf Hitler, Heinrich Himmler, and Joseph Goebbels were not included in the trials because all these men had committed suicide several months before the indictment was signed. The legal basis for the jurisdiction of the court was defined by the Instrument of Surrender of Germany. Twelve of the accused were sentenced to death, seven received prison sentences (ranging from 10 years to life in prison), three were acquitted, and two were not charged. Robert H. Jackson: The chief United States prosecutor at the Nuremberg Trials. Nuremberg Trials: A series of military tribunals held by the victorious Allied forces of World War II for the prosecution of prominent members of the political, military, and economic leadership of defeated Nazi Germany. Third Reich: A period in German history from 1933 to 1945, when the country was governed by a dictatorship under the control of Adolf Hitler and the Nazi Party. The Nuremberg Trials were a series of military tribunals held by the Allied forces of World War II, most notable for the prosecution of prominent members of the political, military, and economic leadership of Nazi Germany. The trials were held in the city of Nuremberg, Bavaria, Germany in 1945 and 1946 at the Palace of Justice. The first and best-known of these trials, described as “[t]he greatest trial in history” by Norman Birkett, one of the presiding British judges, was that of the major war criminals before the International Military Tribunal (IMT). Held between November 20, 1945 and October 1, 1946, the IMT tried 23 of the most important political and military leaders of the Third Reich. One of the defendants, Martin Bormann, was tried in absentia, while another, Robert Ley, committed suicide within a week of the trial’s commencement. Adolf Hitler, Heinrich Himmler, and Joseph Goebbels were not included in the trials because all three committed suicide several months before the indictment was signed. The second set of trials of lesser war criminals was conducted under Control Council Law No. 10 at the U.S. Nuremberg Military Tribunals (NMT); among the second set of trials were the Doctors’ Trial and the Judges’ Trial. 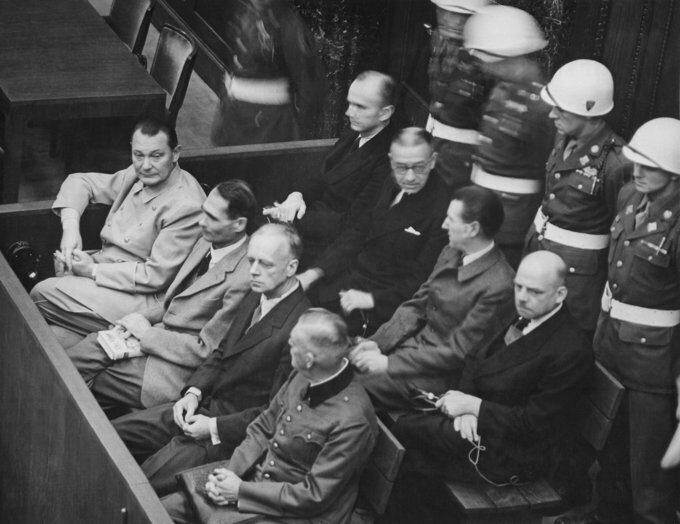 Nuremberg Trials: The main target of the prosecution was Hermann Göring (at the left edge on the first row of benches), considered the most important surviving official in the Third Reich after Hitler’s death. Some 200 German war crimes defendants were tried at Nuremberg, and 1,600 others were tried under the traditional channels of military justice. The legal basis for the jurisdiction of the court was defined by the Instrument of Surrender of Germany. Political authority for Germany had been transferred to the Allied Control Council which, having sovereign power over Germany, could choose to punish violations of international law and the laws of war. Because the court was limited to violations of the laws of war, it did not have jurisdiction over crimes that took place before the outbreak of war on September 1, 1939. Justice Robert H. Jackson played an important role not only in the trial itself, but also in the creation of the IMT. He led the American delegation to London that in the summer of 1945 argued in favor of prosecuting the Nazi leadership as a criminal conspiracy. According to Airey Neave, Jackson was also behind the prosecution’s decision to include membership in any of the six criminal organizations in the indictments at the trial, though the IMT rejected this on the grounds that it was without precedent in both international law and the domestic laws of the Allies. Thomas Dodd was a prosecutor for the United States. There was an immense amount of evidence backing the prosecutors’ case, especially since meticulous records of the Nazis’ actions were kept. The prosecutors had access to records with signatures from specific Nazis for everything from stationery supplies to Zyklon B gas, which was used to kill the inmates of the death camps. Dodd showed a series of pictures to the courtroom after reading the documents of crimes committed by the defendants; these were gathered when the concentration camps were liberated and depicted the atrocities performed by the defendants. The IMT opened on November 19, 1945, in the Palace of Justice in Nuremberg. The first session was presided over by the Soviet judge Nikitchenko. The prosecution entered indictments against 24 major war criminals and seven organizations – the leadership of the Nazi party, the Reich Cabinet, the Schutzstaffel (SS), Sicherheitsdienst (SD), the Gestapo, the Sturmabteilung (SA) and the “General Staff and High Command,” comprising several categories of senior military officers. These organizations were to be declared “criminal” if found guilty. The indictments were for participation in a common plan or conspiracy for the accomplishment of a crime against peace; planning, initiating, and waging wars of aggression and other crimes against peace; war crimes; and crimes against humanity. Throughout the trials, specifically between January and July 1946, the defendants and a number of witnesses were interviewed by American psychiatrist Leon Goldensohn. His notes detailing the demeanor and comments of the defendants were edited into book form and published in 2004. The accusers successfully unveiled the background of developments leading to the outbreak of World War II, which cost at least 40 million lives in Europe alone, as well as the extent of the atrocities committed in the name of the Hitler regime. Twelve of the accused were sentenced to death, seven received prison sentences (ranging from 10 years to life in prison), three were acquitted, and two were not charged. The IMT is celebrated for establishing that “[c]rimes against international law are committed by men, not by abstract entities, and only by punishing individuals who commit such crimes can the provisions of international law be enforced.” The Nuremberg Trials initiated a movement for the prompt establishment of a permanent international criminal court since there were conflicting court methods between Germany and the U.S. during the trials. More than 50 years later, this led to the adoption of the Statute of the International Criminal Court. The creation of the IMT was followed by trials of lesser Nazi officials and the trials of Nazi doctors, who performed experiments on people in prison camps. It served as the model for the International Military Tribunal for the Far East, which tried Japanese officials for crimes against peace and against humanity. It also served as the model for the Eichmann trial and for present-day courts at The Hague, for trying crimes committed during the Balkan wars of the early 1990s, and at Arusha, for trying the people responsible for the genocide in Rwanda.